What has to be one of the largest and most incredible collections of BMWs is up for sale and absolute gems abound. Jeff, of the German Cars For Sale Blog, found a Craigslist post by a guy up in the Northeast who's trying to sell off his vast inventory of BMWs and BMW parts. It ranges from early post-war stuff like the big 501/502 sedans to a gorgeous CS coupe to modern-ish stuff from the '90s. Many of these cars have also been garaged for years to escape harsh weather. Uncover some tarps and there are timewarp pieces like an M635CSi in unrestricted European form. 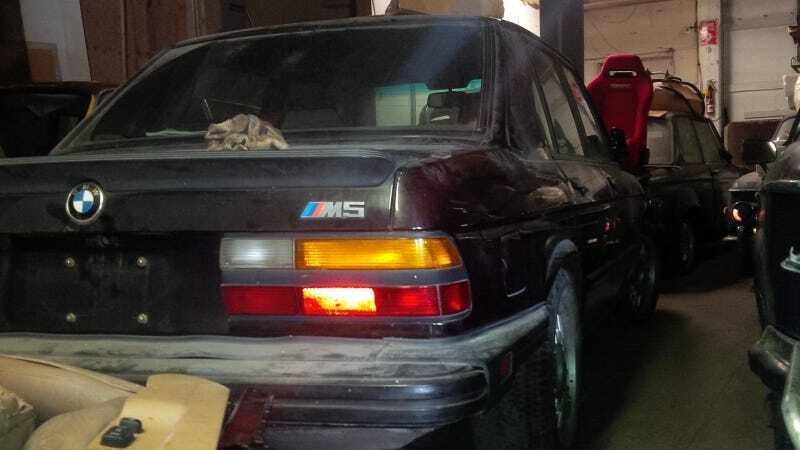 There are also two E28 M5s in the collection. One's got a pretty hard hit to the front, but the other is apparently nice and complete. And an original M5 is a great thing to have. Fans of the 2002 might especially want to take notice because they apparently make up a significant part of this collection. There's even a rare shell of a 2002tii Touring for sale. If you're in the Connecticut/Massachusetts area and have some interest in getting ahold of some old BMWs, you might want to get in touch.